It's one of those simple, and basic things that is easy for those of us who have been working on either side of the whiskey bottle for years often assume is a given that everyone knows. It isn't. The different sorts of glasses and containers offer a variety of experiences that affect the whiskey drinking experience. For those who have never considered these aspects, it can be an eye-opener. Maybe the best thing about these different glasses and flasks is that a whiskey connoisseur can sometimes score one or two of these as swag at conventions or tours. Even if you can't get one for free, it's often worth the price to buy one or three from a gift shop as a practical keepsake and conversation piece. Of all things to drink whiskey from, the shot glass may be the first thing the uninitiated think of, due in large part to pop-culture. The cowboy riding in from the dusty trail and downing a shot of whiskey in a saloon. Or, the college parties where the goal is to get as drunk as possible, as fast as possible. There is a clear image of drinking from a shot glass. It works fine, but it is almost impossible to savor all the whiskey's characteristics with one. A shot glass is best used for two things. Measuring the whiskey for mixed drinks or cocktails, and being a fun little collectible from random gift shops around the world. Next, to a shot glass, the flask is the other drinking vessel people tend to first think about. And like the shot glass, it shares some of the same problems for those looking to savor the experience. The flask does have its uses. They're durable, fit nicely in a pocket on anything from blue jeans to a three-piece suit – perfect for sneaking a drink into the movies or game. However, they will not stop a bullet, despite what the movies may tell you. Also, depending on the quality and the length of time you leave your booze in there, the contents can pick up a slight metallic tinge. 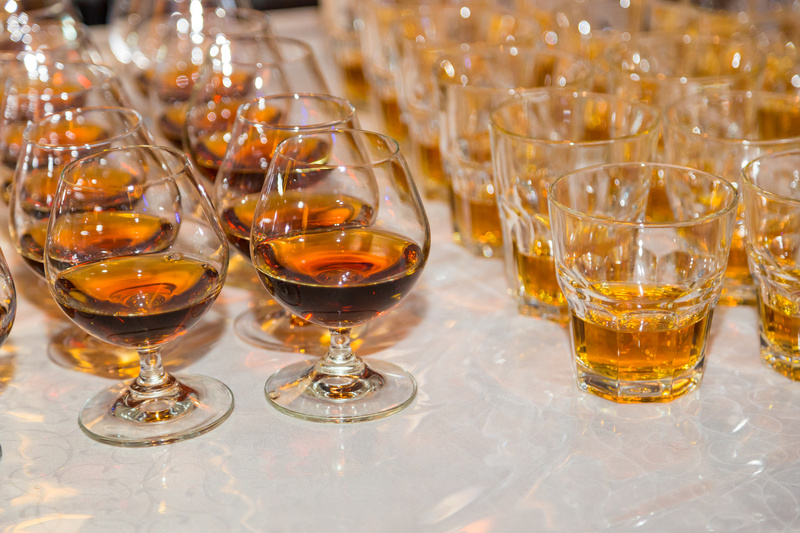 Tasting glasses are designed to give the serious whiskey drinker the full experience. They will hold the right amount of aroma and help balance out the tastes. The main types of tasting glasses out there are the basic tasting glasses which vary in size, shape and may or may not be stemmed. The basic idea is that it will be narrower at the lip than at the bowl so you can experience more of the aroma and flavors. This is a spin on the design of the regular tasting glasses. The Glencairn was conceived in 2001 by Glencairn Crystal specifically to enhance the drinking experience with fine whiskeys. It works great. Some people can't tell much difference between it and run of the mill tasting glasses, but others swear that it's slightly larger bowl helps add more flavor to each sip. The default bar glass for many a mixed drink or whisky served, straight, neat, or on the rocks. It works fine, but you aren't going to get as nice an aroma to savor as you would with a tasting glass. So, with that said, it’s best to keep this relegated to use with mixed drinks than the good whiskey by itself. Think of it as a twist on the above standard. It serves the same function, but gives the drinker a slightly better sense of the whiskey's aroma, and can enhance the taste. It's perfectly fine for the less involved, no frills whiskeys.